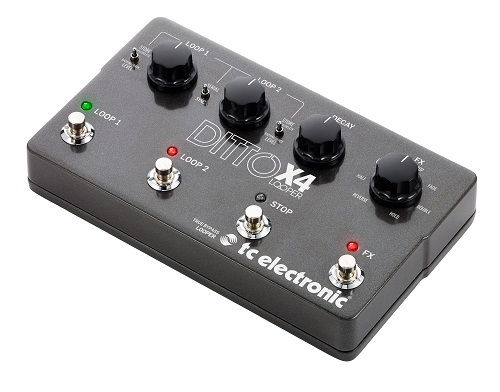 Even though Ditto X4 Looper basically offers endless creative possibilities, it still honors the core principle of our famed Ditto Looper. Simplicity! No drum-machines, no deep-editing menus or other time consuming tech-nonsense, only immediate unfiltered fun. So all you have to think about is – What will you create today? If you thought that having one loop track was fun, then wait until you try running two interweaving and perfectly synced tracks at once. It will blow you away! Run a 4 bar percussive beat in loop 1 and a 16 bar chord progression with endless layers of ambient textures underneath in loop 2, or simply have your verse and chorus set up in each track and seamlessly switch between them for an unforgettable on-stage performance. 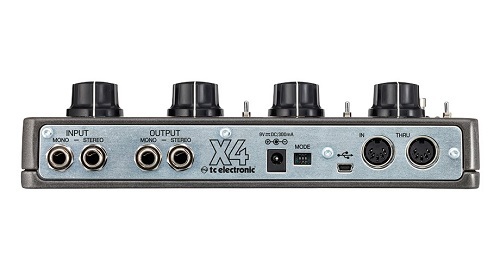 You’re the aural architect, and with Ditto X4 Looper you’ll finally have the tool to realize the sonic wonders inside your head. Imagine this: You got a cool dual loop going, and you can see the crowd is loving it. Out of the blue you engage the Hold FX for a cool rhythmic stutter. The crowd is baffled. Then you reverse your loop and throw them into an otherworldly trance. Finally you hit that Tape Stop FX for a unique jaw-dropping finish to your piece. You look up. The crowd is dumbstruck and smoke is rising from their heads, ’cause you literally just blew their minds! This scenario (which may or may not have happened) just scratches the surface of what can be done with the 7 on-board FX. Now throw loop decay and external MIDI control into the mix, and you have a pedal that will continue to inspire you for years to come.